Our skin care routines often change with the seasons, when skin conditions pop up (hello, hormonal acne) or whenever there is an exciting new Korean beauty launch. (Looking at you, ampoules and rubber masks.) But the thing that remains constant through all of the product trialing is that we always use a towel after cleansing. So, what would happen if that towel turned out to actually be bad for our skin? Washcloths are often criticized by skin care experts because they can build up dirt and bacteria that can be transferred to skin during cleansing. Interestingly, the same warnings haven’t extended to towels — until now. Some beauty gurus are doing away with towels in the name of better skin. As with the majority of beauty trends these days, the no-towel method comes from Korea where it’s actually a common practice for women not to towel-dry their faces. Christine Chang, co-founder of Korean beauty site Glow Recipe, explains that it was one of her mother’s core beauty philosophies. “I still remember her standing at the sink, her face freshly wet from a double cleanse. She would use her fingertips to pat and wick the moisture away until her skin was left slightly damp. She would then move on to her skin care routine, carefully and gently patting in each step,” she says. The big benefit of ditching a towel is that it’s kinder to skin. The rubbing, pulling and friction can irritate freshly cleansed faces, and bacteria is also an issue. Jessica Jeong, marketing & PR manager for Missha, points out that towels, like almost every other surface we routinely come in contact with, can collect bacteria, which can be redistributed to skin when patting it dry. This can lead to breakouts and irritation. Even towels we think are clean may not be. Chang cautions that a towel hanging within a 6- to 20-foot radius of a toilet could get bacteria transferred to it. Ew. Rachel Winard from Soapwalla, Jeong and Chang all recommend not using a towel. Instead of letting your face drip dry, they suggest using your hands to “dry” the skin. Chang advises gently patting skin until it’s damp, making sure to tap the neck, too. (She even posted a video on Instagram to show how it’s done.) Those concerned about dripping can do the routine while bending over the sink. It only takes a couple of minutes to do, so it doesn’t require much more effort compared with using a towel. 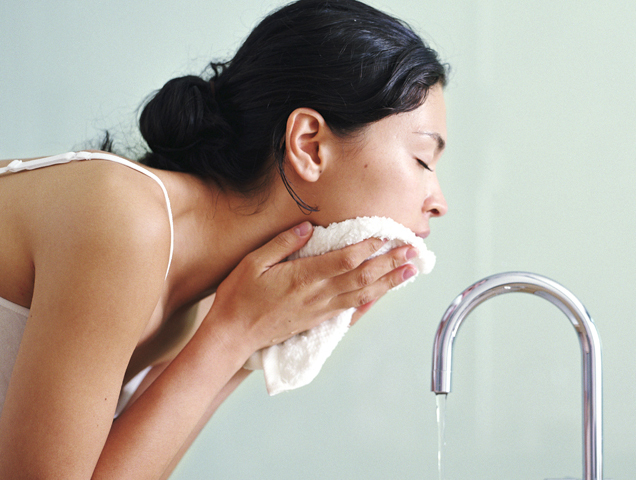 Another reason to do away with the towel is that patting your face dry can help boost your skin care regimen. According to Winard, a slightly damp face is actually the perfect canvas for beauty products because damp skin receives moisture better. For those who aren’t ready to ditch their towels completely, Winard suggests only patting the face dry with a soft, 100 percent cotton towel. Then try slowly using the towel less and see if it makes a difference in your complexion.